Once mistaken for mermaids by lonely sailors, slow-moving manatees roam Florida's coastal waterways. So do ships and fast-moving recreational boats, which injure and kill dozens of these endangered animals each year. In fact, most manatees in Florida bear scars or deformities from being run over by boats and cut by boat propellers. Florida manatees range in length from about 10-12 feet and can weigh between 1,000 and 1,800 pounds. Their skin is grayish-brown and covered with sparse hairs. The body of a manatee is streamlined with fore-flippers and a large, paddle-shaped tail. They are herbivores and eat primarily submerged and floating plants. Florida manatees inhabit the coastal waters of the Southeastern U.S. A migratory species, in the summer they can be found as far west as Louisiana and as far north as Virginia. They live in shallow, warm coastal waters, as well as rivers, springs, bays, estuaries, canals and warm water outfalls. Related species of manatees are also found in Puerto Rico and coastal areas of the Caribbean and Central and South America. Fast-moving power boats are the greatest threat to manatees—killing as many as 80 and injuring countless others each year. Sadly, most Florida manatees bear scars or deformities from being run over by boats and cut by boat propellers. 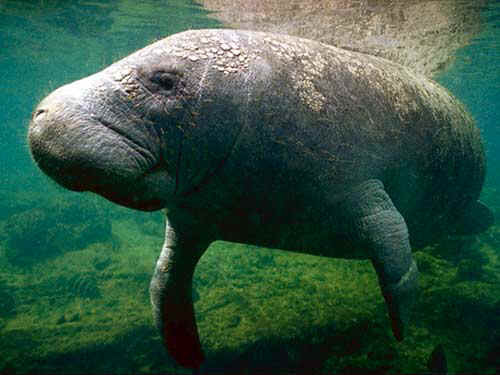 Listed as endangered under the Endangered Species Act, manatee populations number about 3,500 individuals.. Although they used to be hunted for their meat, oil and their tough hide, other current human-related threats include crushing in flood-gates and canals locks as well as entanglement and ingestion of marine debris. Natural causes of manatee mortality include red tide, cold stress and pneumonia, disease and parasitism. Numerous calves die each year as well. In the last decade, manatee mortality has averaged over 200 individuals per year—60 to 80 are killed by speedboaters. However, in recent years, total mortality has topped 300 and watercraft deaths have topped 80 individuals and deaths continue to rise. Be a manatee-friendly boater! When boating, obey posted speed zones, go slow in shallow waters where manatees tend to rest and feed, wear polarized sunglasses to reduce glare, never allow fishing line or other debris overboard; and watch for signs of manatees in the area. Participate in cleanups! Participate in monofilament (fishing line) cleanups or coastal cleanups and and always pick up litter any time you are on or near the water. Be respectful! If you see manatees in the wild, respect their natural behaviors. Never disturb them—especially while they rest or feed, or mothers with calves. Never give them food or freshwater.